I've shied away from wearing bold colors in the past, and the one shade that really seemed to scare the heck out of me was red. Too vibrant, too attention grabbing, too "look at me". I really dislike attention in public, which is pretty strange considering I write a blog on the internet. I know, I don't understand it either sometimes but I feel like I'm getting more and more comfortable with a little attention. Yes red is powerful, but it's also incredibly feminine and it forces me to come out of my shell a bit. There's nothing to be shy of, right? Paired with softer accessories, I let the dress be the star. Although I'm loving my new bag, and I think it's worthy of special attention too! I can't wait to review it for you so look for that in my next post. I love pops of red but I agree, all over red (or any bright color) can be scary. Lol I definitely think the style/shape/tone of the color can all help it feel more comfortable just like you did here. 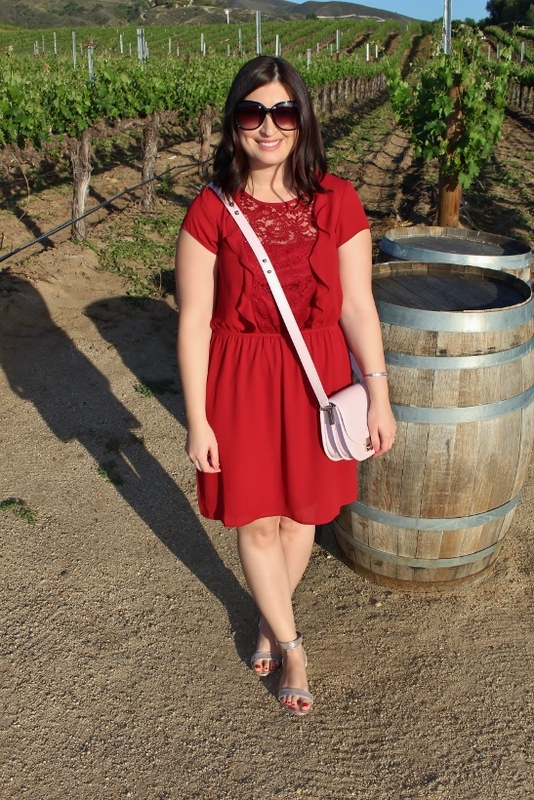 Love that color red on your and style of the dress is super cute- great details! You look great in red but I completely understand your feelings about it! It feels like a Bold Statement Color and I have to be in just the right mood for that. I'm glad you went for it with this dress though! Very pretty and can't wait to hear more about that cute bag! Yay you found your new bag! Can't wait to read more about it. Red looks gorgeous on your colouring - wow!!! I know what you mean about red drawing in attention - I used to feel that way about red lips - but once I got used to it, I realized it wasn't as "loud" as I thought. But I still shy away from red dresses - am working my way towards it with red accessories lol. Always looking gorgeous! 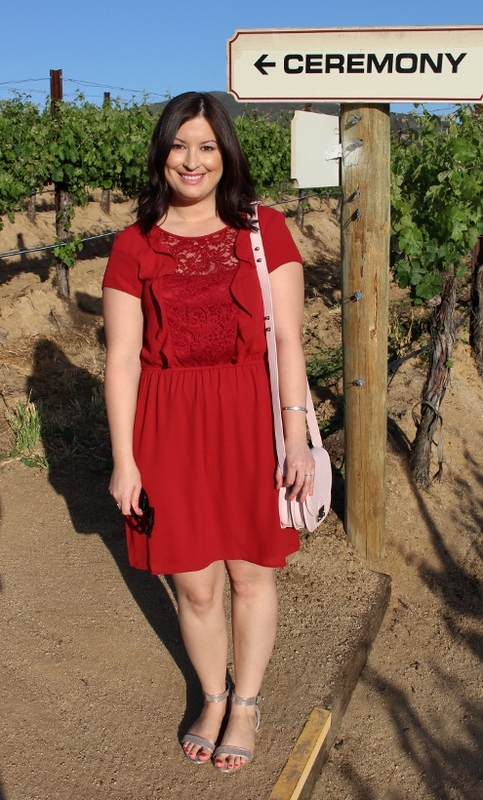 The wineries are my favorite place to visit up in temecula. Which are your favorites? i'm glad you wore this because the color looks AMAZING on you!!! Red is a powerful, feminine color, and I love it on you! Glad you decided to go for this dress. Noelle! Red looks gorgeous on you! I know what you mean about shying away from colours (I definitely do) but sometimes it's fun to throw people for a loop with something that's out of your comfort zone.